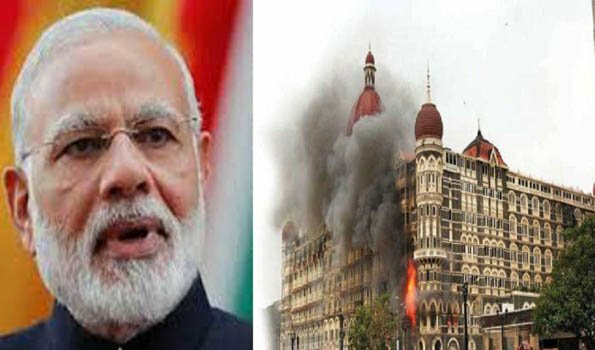 New Delhi:Prime Minister Narendra Modi on Monday paid tributes to "brave police and security forces" who laid down their lives during the gruesome 26/11 terror attacks in Mumbai. "Tributes to those who lost their lives in the gruesome 26/11 terror attacks in Mumbai. Our solidarity with the bereaved families," Prime Minister tweeted. "A grateful nation bows to our brave police and security forces who valiantly fought the terrorists during the Mumbai attacks," he further wrote. In another tweet, Mr Modi said: "On Constitution Day we recall with pride the stellar contribution of the greats who served in our Constituent Assembly. We are proud of our Constitution and reiterate our commitment to uphold the values enshrined in it". The Constitution Day (National Law Day), also known as Samvidhan Divas, is celebrated on November 26 every year to commemorate the adoption of Constitution of India. The Constituent Assembly had adopted the Constitution of India and it came into effect on January 26, 1950.